Last week, a three-year-old North Carolina boy went missing in the woods. Toddlers are notoriously bad at taking care of themselves even in the best of circumstances, but freezing temperatures lowered his odds of survival from slim to practically none. Casey told police he survived due to the presence of a black bear, which kept him company. The boy repeated the story to his aunt, Breanna Hathaway. I realize Servheen is only trying to dissuade people from going out and trying to befriend wild animals, and to that end: OF COURSE THIS IS FAKE. HA HA. STUPID KID. But history and YouTube contain innumerable examples of interspecies relationships, and I know, in the quiet of heart, that a bear rescued that child. 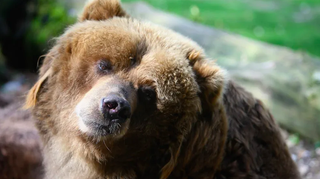 I am not saying anyone should toss their kid outside, assuming a friendly bear will show up and babysit it for free, because that won’t happen! You can’t engineer this stuff. But tomorrow, when you wake up to the latest news about Trump felling a virgin Amazon rainforest so he can build his border wall entirely with the teeth of endangered Pygmy sloths, and you think that there must be no good left in this whole accursed world, remember: A bear saved a child from dying in the woods. And you will feel at least .005 percent better.